Hi everyone! I’m Henri! 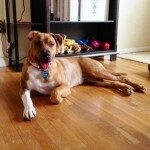 I’m an incredibly good-natured, generally mellow boy, who is also playful as a puppy! I love to play and I am really pretty goofy sometimes! When I am in a playful mood you can tell because I will throw my ball around for myself and flip my bed around and roll all over barking with joy. My other favorite things to do are get belly rubs, and sleep next to you while you watch TV. I am even learning to play tug! My favorite game is to play ball in the house, especially with a squeaky ball (whoever figured out how to put a squeaker inside of a ball is my favorite person!!) I haven’t learned to chase a ball outside yet but with practice I might learn! Despite my playful nature, I am not a high energy pooch. I love a good walk (more on that below) and love to run around and explore a fenced yard, but in general, I’m very laid back and love to take lots of naps! I do have a time or two during the day when I get excited, “bouncy,” and happy, but it doesn’t last that long and then I am back to being very mellow. I know that I am exceptionally cute because my people say that every day. I love my meals and I love treats and will take them from your hand as gently as a lamb. I have learned lots of skills in my 2 short years! When my people ask, I can sit, down (lay down), stay, touch, wait and even leave it (they put treats on my toes and tell me to wait – can you believe it – I do it because I love them!). I’m not so terrific at “come” but I am willing to keep trying! On walks I do best when I do not have to meet other dogs… I like to look at them from a distance, but get quite nervous if I have to be near them. I’m definitely NOT a dog park kind of guy, that would be really overwhelming and unpleasant for me. I really like my humans best. I am a bit nervous when I meet new people, so I do need someone who is willing to be understanding. Once I have a little time to get to know you, I am a big cuddle bug and loverboy! I would need you to keep this in mind though and be thoughtful about my introductions to new folks. I’m not the type of dog who would enjoy going to parties or parades or places with lots of people all at once, but I’m looking forward to meeting your friends, in a calmer sort of situation! Once I get to know you and your friends, I will love you forever and you will be my best friend!! I am completely potty trained and don’t have accidents in the house, but can occasionally be a bit rascally! One of my favorite tricks is to unroll the toilet paper from the roll and munch on it, which might be why my people put me in my crate for a rest when they leave the house! I live with 2 dogs and 2 cats right now. I get along great with my little sister doggy, who is a Yorkie, and I love the cats and want to play with them! Since I’m big and playful, I would probably be most appropriate for cats who thought that was A-OK! Unfortunately, things are not good between my brother dog and me. We get into fights. We’ve worked with a trainer and taken other suggestions from our vet, but bottom line is that I just shouldn’t live with another male dog. I seem fine with females (though need slow and careful introductions), but am just not comfortable sharing space with a male dog. So, although everyone loves me and it breaks their heart to rehome me, we all know that I will be much happier either as an only dog or in a home with only a female. I am hoping for a person or people who love big handsome dogs like me, and who want someone with a mixture of playfulness and mellowness. 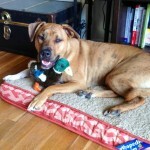 I love to snuggle and play and to spend time with my people, so want a new home with folks who want that too! I would be fine as an only dog or sharing my home with a nice female dog. I would be happy to have cats around, but it’s ok if you don’t have any! 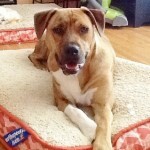 To apply to adopt me, fill out an adoption application and the rescue folks will forward it to Henri’s owners! 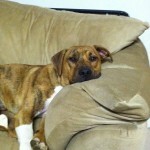 good with cats, good with female dogs, good with mature kids, Lab/Boxer mix, large, male, neutered, young. Bookmark.